For a sporting community that has always exuberantly lapped up the two opposing poles of human emotion, this was a weekend that had it all. There was controversy, calamity, heartbreak, triumph and skill beyond imagining. They might exist as polar opposites, iterations of motorsport from two different planets, but this weekend the Monaco Grand Prix and the Indy 500 complemented each other perfectly and in so doing wrote sporting headlines across the globe. The story of the weekend began in Friday’s F2 race at Monaco in a spin-off to the weekend’s main narrative that was never going to grace mainstream headlines, but nonetheless worthy of recognition. Worthy because of Monaco-resident Charles Leclerc’s virtuoso performance in, ironically, his first race on his home streets. It was a performance that was perhaps unsurprising from a man who has effectively been able to do no wrong in single-seaters in recent years, having effortlessly made the notoriously tricky transition to the Dallara GP2/11. However pole and unattainable race pace would be for naught following an untimely safety car and suspension failure. Devastation for Leclerc, elation for Oliver Rowland on the circuit where he gave an overtaking masterclass in Formula Renault 3.5 in 2015. 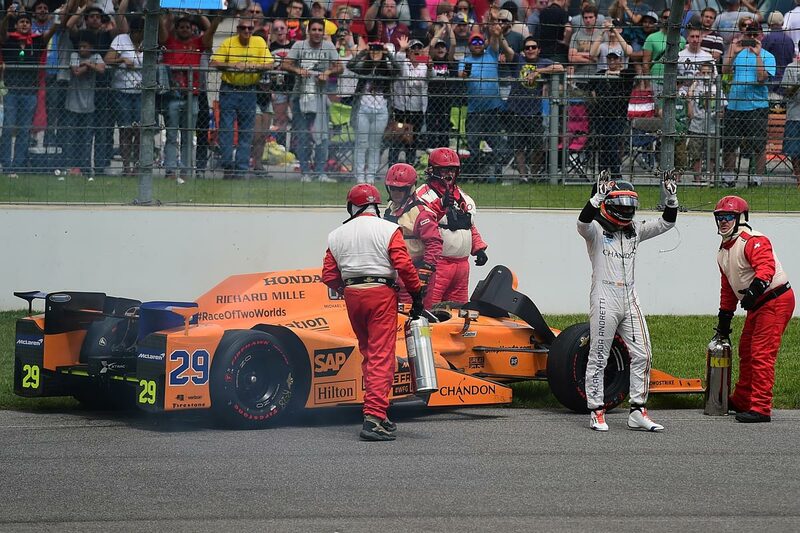 Meanwhile in Indianapolis, Helio Castroneves was flexing Penske’s muscles on Carb Day, and Alonso was matching his phenomenal grid spot with fifth in the standings. Saturday was all about Kimi Raikkonen. At last the Finn took a breath, parked the pugnacious Saturday monkey on his back, and produced some stunning commitment and skill to take a pole position 128 races in the waiting. Jubilation for Kimi’s fans was soon stained by paddock whispers concerning the realpolitik of the situation: with a wayward, frustrated Lewis Hamilton down in just 13th on the grid, and with upcoming circuits such as Silverstone, Spa and Monza likely to suit Mercedes, the Scuderia needed to maximize the championship damage on a circuit that suited the SF70H. Come raceday, the situation failed to rectify itself in the most organic manner, and Kimi duly lead into Saint-Devote. What unraveled was ambiguously controversial, suspiciously convenient for the Scuderia’s championship but at the same time rather elegant and spontaneous. Whilst I will unpick the nuances of the controversy in an upcoming article, the indisputable fact remains: Vettel would not have had a route to victory had Raikkonen’s pace been better in the race. …across the pond what transpired in the 101st running of the Indy 500 is almost beyond the powers of verbal expression. Of course the thumbnail image of a dramatic race was the sickening, horrific aerial crash for pole-sitter Scott Dixon. Given the fact that his car, having been launched by Jay Howard, landed sideways across the top of the S.A.F.E.R. barrier, it is neither sensationalist nor melodramatic to say that Scott is lucky to be alive. However even a crash of such proportions could not steal the limelight from the man who would inevitably steal the headlines. For varying reasons, Fernando Alonso did not disappoint. Despite falling from fifth to ninth off of the stsrt, Fernando was the man of the opening stint, and his McLaren-Andretti had the pace to quickly climb the order and place him with the leaders; indeed he duly lead twenty-seven laps of the race. It was the performance of a cerebral racing master, the performance of an oval racing veteran. For me, it was the performance of the most complete racing driver in the world. Meanwhile, whilst Fernando was making new fans in an otherwise phenomenally successful PR outing for F1 (and again, whilst I have made this point before, much credit must go to Zak Brown for this ingenious labour of passion), a three-time Indy 500 winner was battling for his fourth with a man who came within a lap of victory in 2012. Eventually, even Castroneves’ experience could not keep him ahead of an Andretti team that had set the pace all afternoon, and Sato exultantly took his first Indy 500 win. But whilst the weekend’s plaudits were predominantly enjoyed by Sebastian Vettel and Takuma Sato, I think it was motorsport as a whole who enjoyed the biggest victory this weekend. All across the world, whether it be the BBC or ESPN, the US or Europe, newly found linkages between the great American and European motor-racing latticeworks wrote sporting headlines that would not have otherwise existed. Monaco and Indianapolis were dripping in human drama, and the news outlets of the world have found the rather filmic narratives magnetic. Were these “good races”? No, not really. Monaco without variables like tyre degradation and dynamic riviera weather conditions was predictably processional, and the incessant cautions in the 500, occasionally truncated by the odd near-fatal accident, meant the race lacked any kind of rhythm. No, these weren’t especially good races, but they were good footholds for motorsport in the eternal and essential crusade to climb up the sporting news agenda. Motorsport, particularly that regulated by the FIA, has historically been astonishing bad at promoting itself, or even acknowledging that there are other sports and other pastimes competing for its audience’s attention. Perhaps a weekend like this, with such residual drama and catharsis, can be a small but significant step in the right direction.